From Goodreads ~ Seventeen-year-old Char has studied music but didn't think of it as a future until she posted a video of herself singing and it went viral. So now, instead of going to queer youth events or taking part in the Gay Lesbian Alliance, Char spends her time figuring out how to get enough online fame to fuel a singing career. When one of her videos is bombarded with vicious online comments, she is pleased to find an app that offers support and encouragement to people who are being bullied online. Using the handle Charming, Char gets to know the creator and moderator of the app, who calls herself Cinders. Cinders inspires Char to reconsider her obsession with having the ideal online presence and concentrate on who she really is. But when Cinders turns out to be Ash, a shy girl who goes to the same school, Char must find a way to show Ash how much she means to her. 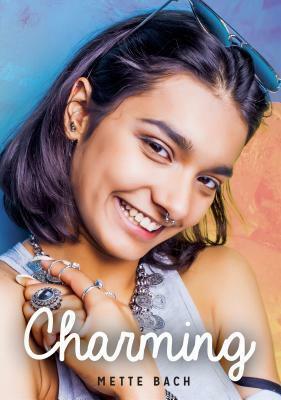 With a modern female version of Prince Charming as the main character, Charming expands the story of the fairy-tale prince to one of a teen girl who learns the true nature of fame and love. Char is in her last year of high school. Her parents are well-to-do realtors who expect Char to go on to university but she just wants to make music. She uploads videos of herself on YouTube singing to build a following. She is obsessed with how many views she receives and gets bummed when there are negative comments. She suspects she is being trolled by Mimi, a mean girl at her school. She comes across an app called SendLove, which supports people who are being bullied online and becomes friends with the creator, Cinder. With Cinder's friendship, Char realizes that she can be who she really is and not worry about what others think. This is the second book I've read by this author. This book runs parallel with Cinders, which is told from Cinder's point of view (both books are written in third person perspective). It was interesting to read both books back-to-back because we get to know the girls more in their own books with their back stories. I liked Char. She knows who she is but is afraid to let anyone else see. We see her grow and become more confident throughout the book.